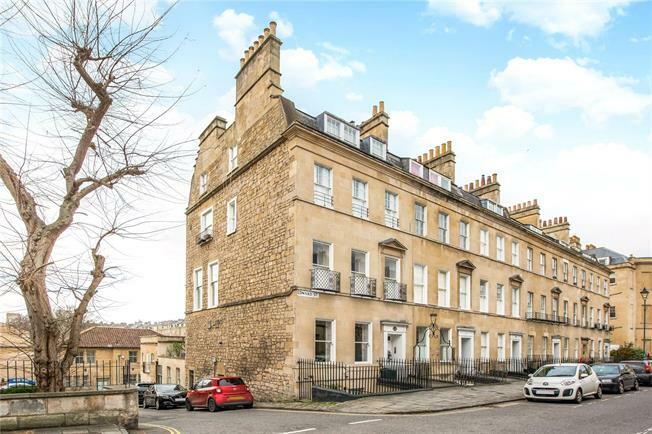 3 Bedroom Flat For Sale in Bath for Guide Price £950,000. This is truly the most stunning apartment. From Edward Street the communal reception hall leads into the private entrance and stylish drawing room and with-drawing room. These beautifully proportioned rooms, the interior design and colour palette create an ideal ambience. Painted floor boards, high ceilings and handsome fireplaces in each of the rooms add to the appeal. Tall windows open out to the rear. The maisonette benefits from three entrances, one upstairs and two downstairs, one opens from the small side lane of Pulteney Mews and one onto the front courtyard. It provides access into the smart and contemporary kitchen, a super space with tall ceilings, polished marble flooring and sleek units designed and built by the Bath Kitchen Company. The attention to detail is excellent with a walk-in larder unit, integral appliances and a beautifully crafted work surface. Glazed full height windows and double doors open into an inner courtyard. The marble flooring with under floor heating continues along the hall creating a seamless link into the bedroom wing. All the rooms are double, the first is served by a very smart shower room. The larger bedroom overlooks the front courtyard and has an en-suite bathroom with a wonderful oval tub and limestone flooring. Discreetly designed storage runs the length of the hall leading down to the vaulted bedroom suite. The curvature of the ceiling creates a cocoon like bedroom and the adjacent luxurious bathroom has a raised shower area, free standing bathroom adds to this beautifully tasteful suite. There is also a further reception room on the lower ground that makes the perfect TV room or office. Edward Street is a terrific Bath address situated just off Great Pulteney Street, one of Europe’s finest Georgian streets. The famous Holburne Museum and its surrounding Sydney Gardens is just a stroll away. From Sydney Gardens there are attractive walks and cycle rides along the Kennet and Avon Canal giving access to beautiful open countryside, whilst all that historic Bath has to offer is just a level walk along Great Pulteney Street. A wide range of amenities including extensive shopping, theatre and art galleries are within the city centre. The commuter will be pleased to note that Bath Spa Railway Station is also within walking distance and has a direct line to London Paddington (approximately 90 minutes). Junction 18 of the M4 gives access to London, Bristol and the M5 serving the Midlands and the South West can be found some 10 miles to the north. Services – All mains connected, gas heating and under floor heating under the marble flooring. Tenure – Share of Freehold. Term of Lease – 999 years from 06.08.1999. Service Charge – £3,600 per annum. Ground Rent – £100 per annum.